It’s no secret that I’m a HUGE fan of MUA. Every product they make seems to be such high quality and still they manage to keep their prices purse-friendly. 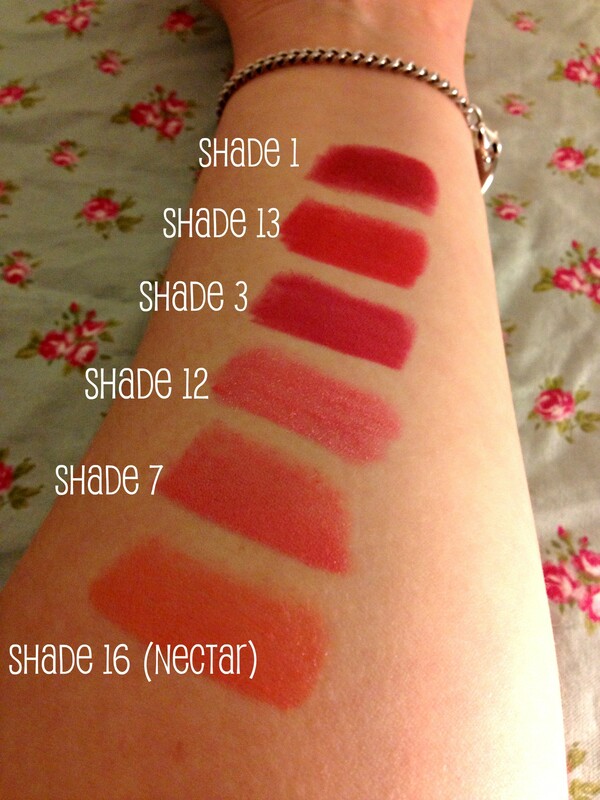 At just £1 each it’s a surprise I haven’t snapped up all 16 shades, but amazingly I’ve resisted…for now! I’m sure there have been plenty of swatches of these budget beauties, but I thought I’d swatch my collection and share it with you anyway. 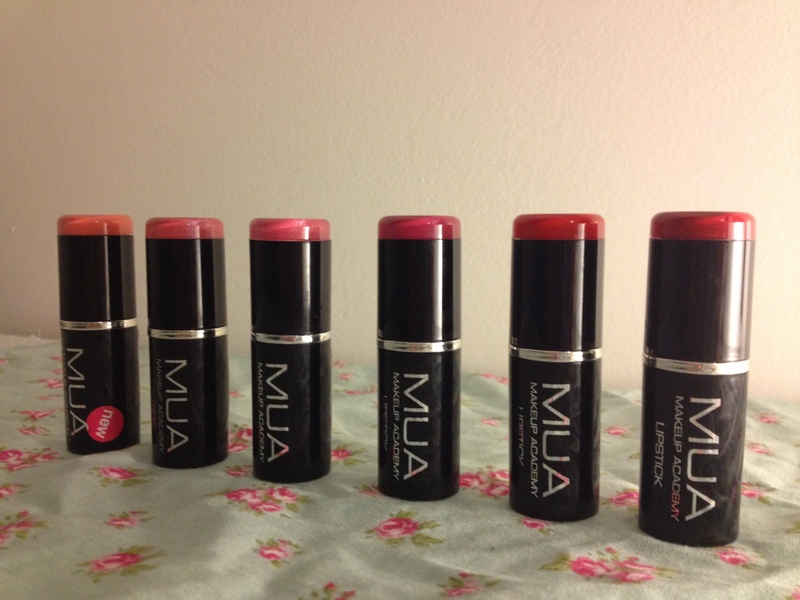 In total I own 6 MUA Lipsticks in a range of colours. In my opinion if you only want to get a sample of these lipsticks, these are the ones to pick. 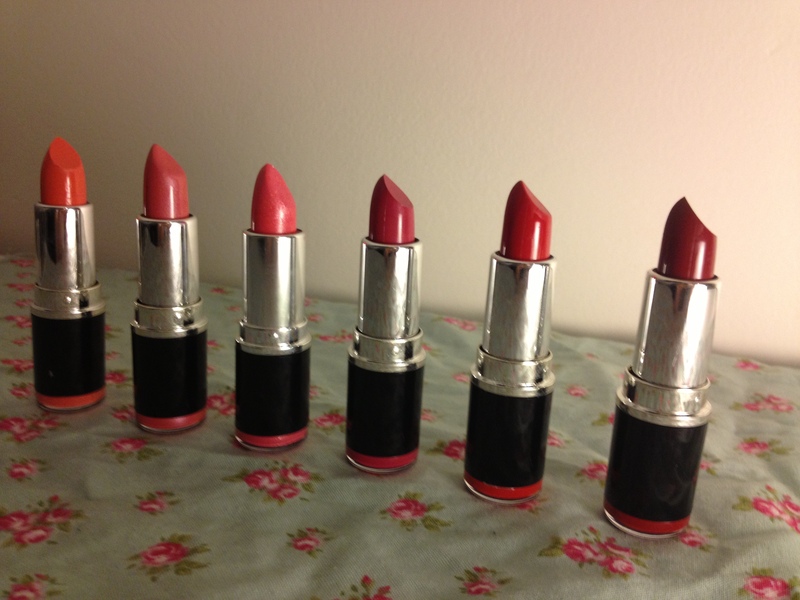 These lipsticks have a really creamy texture and apply like a dream. They have a vanilla-like scent to them which isn’t unlike another of my favourite beauty brands, but at a fraction of the cost. Wear time is pretty standard at around 4 hours. Shade 16 (Nectar) – This is one of the rare shades that has a number and a name. This is a muted orange-toned coral that looks fab in the Summer. Shade 7 – This is a lovely natural rose tea coloured lipstick that gives the perfect flush of colour. Shade 12 – Swatched this one is a super blingy, chunky, glitter ball of a pink. On the lips it’s not quite as garish but does tend to wear off leaving glitter all over your lips. Shade 3 – This is a bright fuchsia pink, perfect for nights out or days when you want to rock a bright lip. Shade 13 – This is a yellow based bright red. A great way to rock a red lip on a budget and leaves a lovely stain to the lips as it wears off. Shade 1 – This is a lovely deep, blood-red shade. The perfect vampish red for the Winter months or nights out. Ultimately these are a fab way to experiment with new looks without sending your bank card into a meltdown. 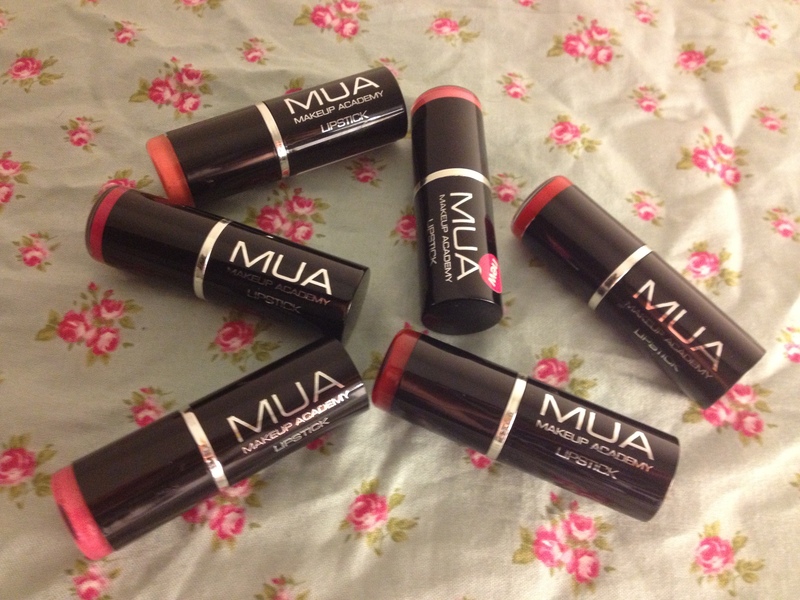 Have you tried any of the MUA Lipsticks? I’d sort of always assumed that because they were £1 they would be rubbish, made me think again! Think I’ll pick up shade 7 and 16 in the week. I love MUA. Lipsticks and eye shadows especially. Such a bargain!